Only 7% of clients find their next agencyafter that company has reached out to them. Most clients are selecting their next advertising partner based on referrals and their own research. They are looking for and vetting potential agency partners, using their increasing power as a digitally informed buyer to make smart decisions. And while cold calling, direct mail campaigns, and time spent at an endless number of networking events might be bringing in new business, it’s not a scalable activity. Your agency needs more people to spend more time prospecting and more time making connections. And if your new business manager quits or his priorities are shifted, that pipeline dries up. Then you’re left looking at a forecasting spreadsheet that will have you scared. 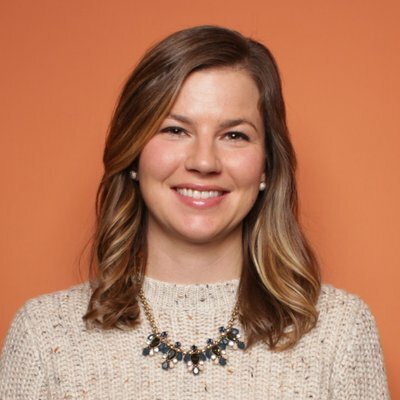 According to Hinge Research Institute, professional service firms that generate 40% of their leads online grew four times faster than firms without online lead generation strategies. In addition, they found that high-growth firms (companies that grew five times faster than their peers during a two-year period) mark lead generation as a top marketing priority of the firm, while their peers indicate that they focus on activities such as thought leadership and hiring more sales reps.
To scale your new business program, thus creating more predictable profits for growth, hiring, and reinvestment in your company, you need a solid strategy for generating leads. We’re not going to delve into what a lead is here or an in-depth explanation of why you need leads, so if you need a primer, check out this post. Instead, let’s discuss how to generate leads with the specific goal of attracting potential clients -- the type of clients you want. The first step -- prior to outlining a campaign or determining what type of content you will produce -- is to document or review your ideal client profiles (or buyer personas). You'll need an in-depth understanding of who actually buys your services and the types of clients that are profitable for your agency to create content to attract more of these types of clients. You should be able to talk about this ideal client like he or she is a good friend. What’s his role? Whom does he report to? 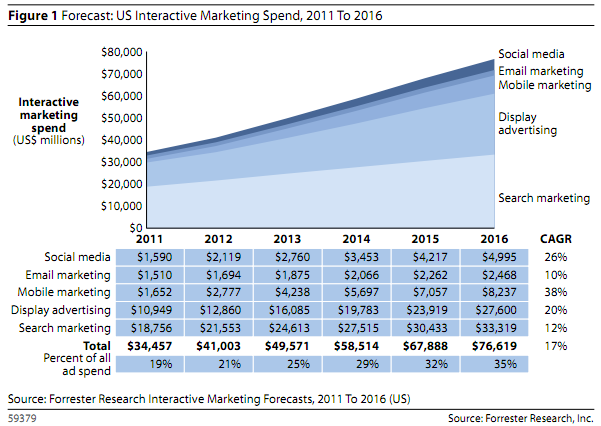 What is the typical size of his marketing budget? What’s his company’s annual revenue? What are his goals? What does his company’s sales process look like? What are his biggest marketing challenges? What keeps him up at night? If you don’t have detailed information on this, collect it by interviewing your best clients or former clients and staff members. Oftentimes, there is a disparity between whom the business leaders want as their clients and which types of clients are actually the best fit for the agency’s current capabilities, workflows, and attitudes. When you have this information, you'll better understand what types of content resonate with the client, how he likes to receive information (email, social media, print, digital, etc. ), what channel you would be most likely to reach him on, the tone of voice he connects with, etc. This helps you to create a more targeted content offer and a more effective promotion strategy. Once you know your person, you can start by determining your goals for lead generation and the resulting value to your agency’s business. Set goals for overall visits, leads, and marketing qualified leads or sales qualified leads, and new clients. Based on your historical conversion rates, you will be able to determine how many visitors you need to drive to meet your different goals. You can also tie this back to your overall goals for the new business team for the quarter. For example: Say you want to bring in $50,000 in revenue in Q1. The average price of a project is $15,000, and the average close rate of a lead is 10%. That means that the value of each lead is $1,500. 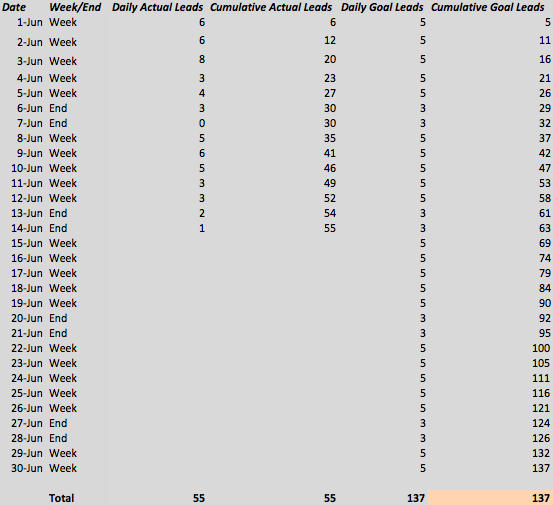 To reach your quarterly goals, you need to generate 33 leads. You landing page is your sales person. If you’ve done your job -- determining a great topic that is interesting to your target audience and driving visitors to the landing page -- then the landing page should make it easy for the person to convert. Your landing page design should be simple -- remove the navigation bar or any other distractions that take the attention away from the single value proposition. Include a compelling headline, an engaging image or video, the specific benefits of the offer, and testimonials to increase trust. 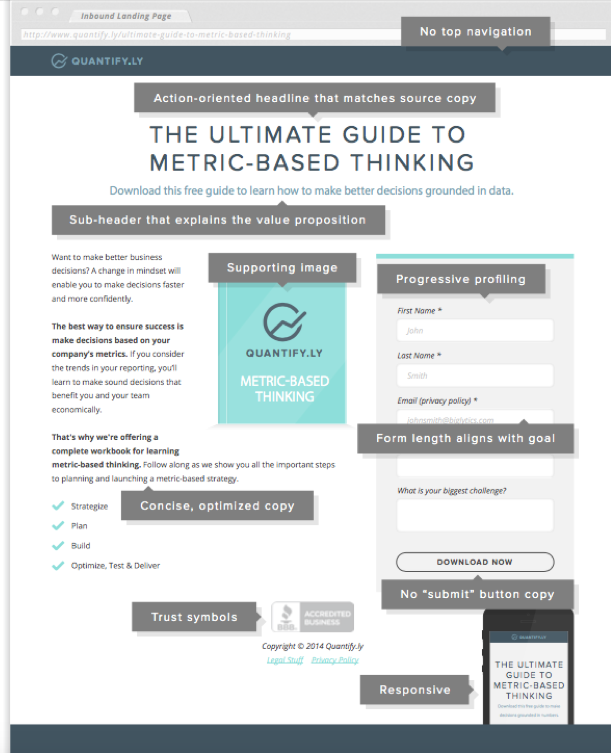 Click here for great landing page design examples that will inspire your own or review the below image for best practices on structuring your landing page. Form length and design all work to reduce the inherent friction between what the visitor wants (the content) and what your company needs (the lead’s information). The first step is making sure that the content you place behind a form is of high value. You are asking for personal information from the person, and they are trusting that what they will receive from trading this information will be useful. When building your form, consider what information you absolutely need to ask, or use progressive profiling technology to reduce the length of your forms by only collecting new information about the lead. To increase the conversion rates of forms, include a headline that clearly states the value proposition for the prospect. Try removing the phone number field, as this has been shown to reduce conversion rates by 5%. 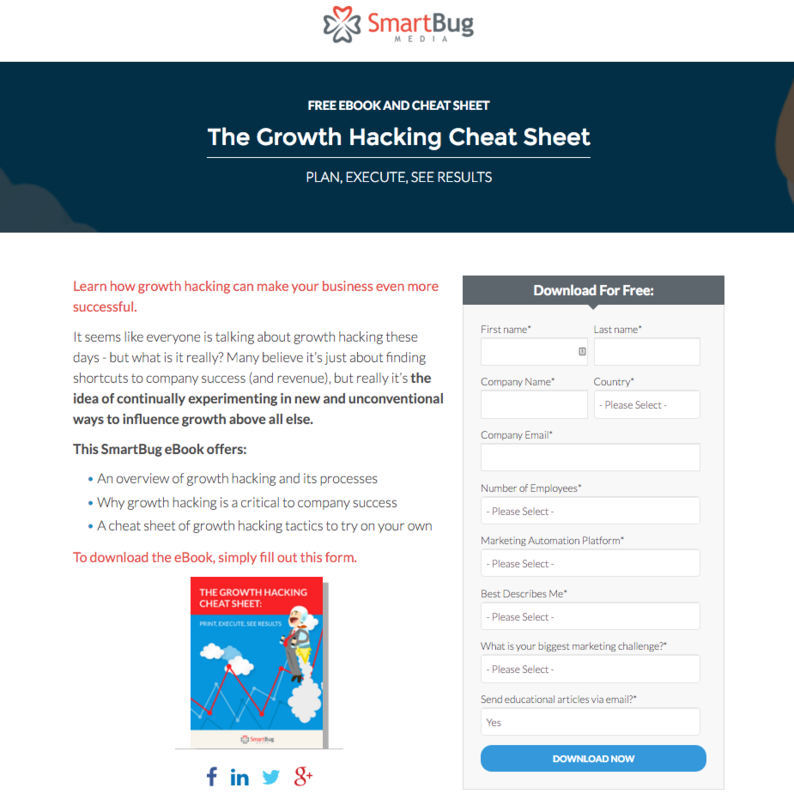 QuickSprout found that landing pages with only three fields had a 25% conversion rate, while this number dips to 15% when you include more than 6 fields. The more fields you include, the lower the conversion rate will be, but including more fields will also result in higher quality leads. You need to balance the two when creating a form. This should be something that would be of high value to your target audience. If you’re a web design agency looking for more SaaS clients, you could create a guide on best practices for SaaS websites. If you focus on the healthcare industry, you might create a checklist for healthcare marketers. One approach you might take it to see what search terms your blog or website is already getting found for. If you have a blog post that brings in a high amount of monthly organic traffic already, consider creating an in-depth guide on the subject to increase conversions. 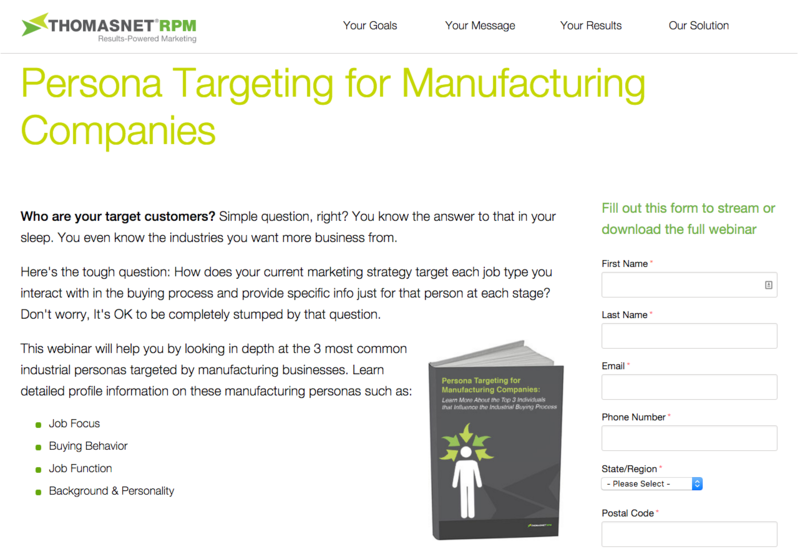 ThomasNet RPM provides inbound marketing services to manufacturing and industrial companies, making this on-demand webinar a perfect fit for its target client. SmartBug Media details a type of marketing that would be of high interest to its prospects. 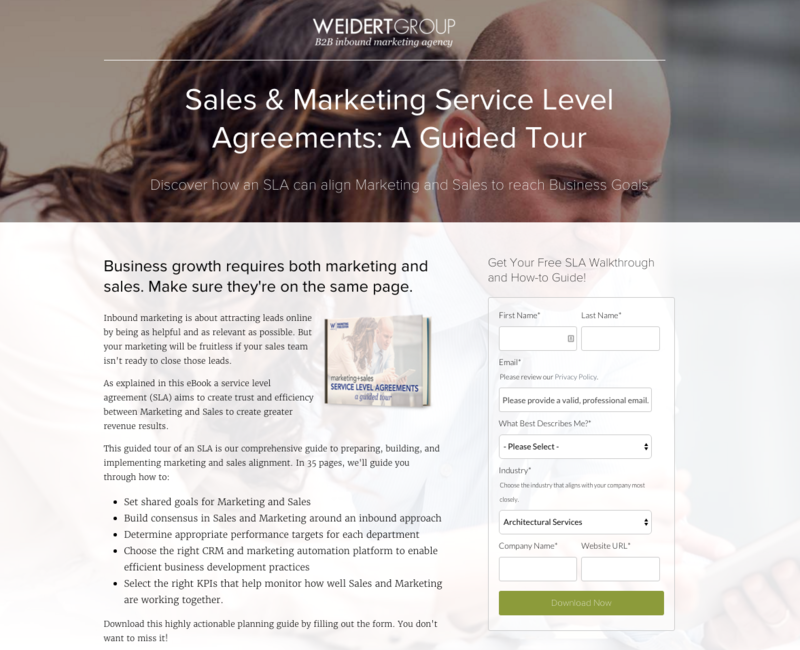 Weidert Group wants to attract marketing executives who are interested in the alignment of their goals with their sales team's target. Kuno Creative focuses on attracting healthcare executives for this campaign. A content offer to drive your lead generation strategy doesn’t have to stick to the ebook format either. You could create marketing kits, film an educational course, conduct research, or create a useful tool for your audience. You could also place an agency case study or fact sheet (Here’s an example from Hill Holiday) behind a form. On the landing page, the call-to-action is the form submission button that prompts the person to take an action -- to click. Don’t rely on “submit” as using this word has shown to decrease conversions by 3%. 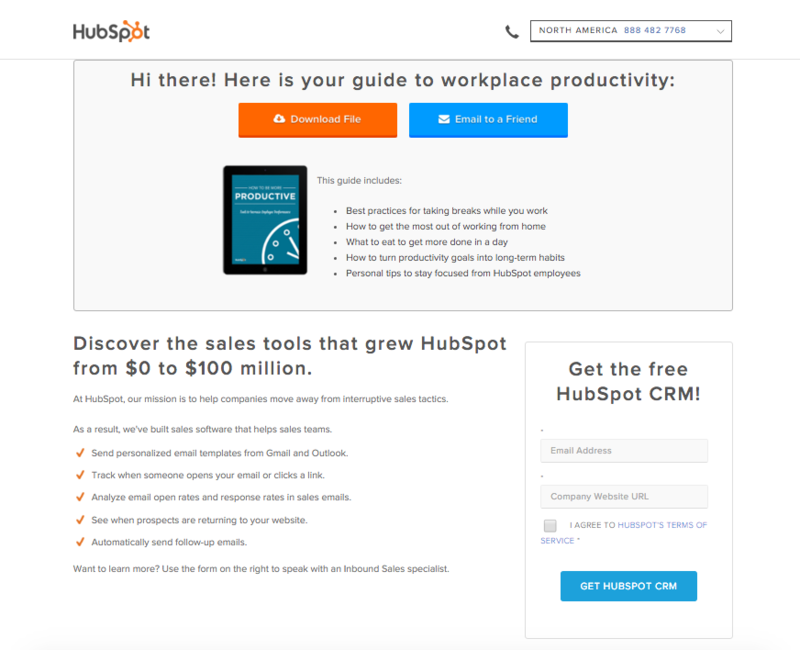 Here's an example of a HubSpot thank you page that continues to emphasize what's included in the guide and drives people to sign up for our free CRM. An email containing a direct link to the offer should be automatically sent to anyone who fills out the form. This way, people can revisit the content at any time in the future from their email account. In addition, it's an opportunity to promote other offers, such as a push to subscribe to your blog or attend an upcoming webinar/event. This email gives your agency the opportunity to begin more one-to-one communication with the person. 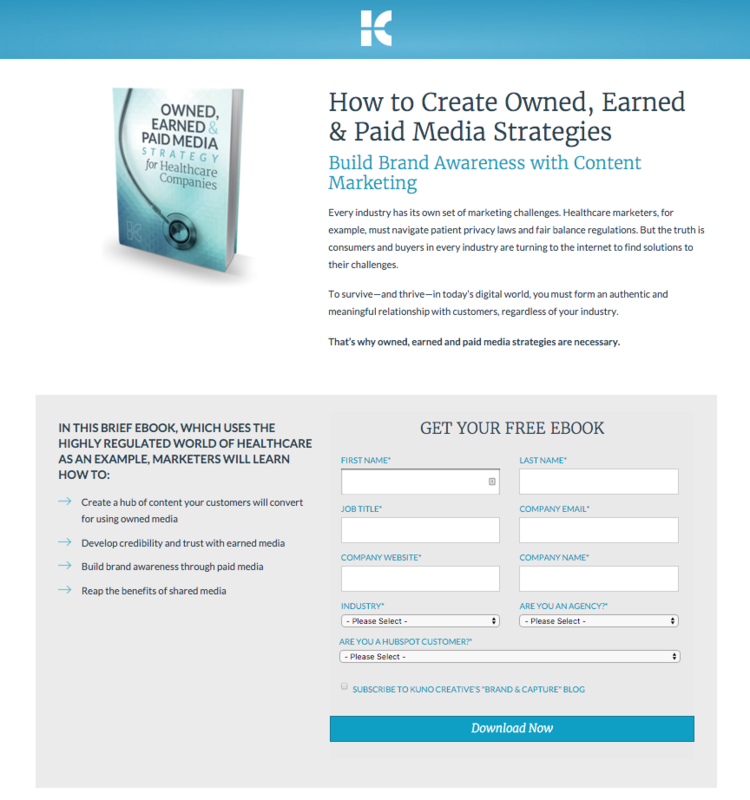 Once you’ve created your campaign assets, you’ll want to begin to plan a promotion strategy for your ebook or content offer. Begin brainstorming a few different blog posts on the subject that you can publish on your own website. You could also research blogs and publications whose audience aligns with the target persona of the ebook. Research the site’s past articles on the subject, and come up a topic that would provide value to the site’s readers. 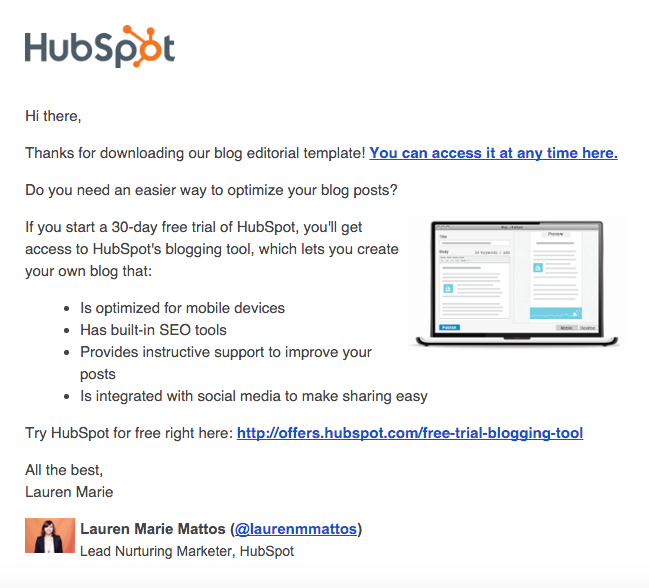 Use this guide to pitching editors to get your guest posts published and generate more referral traffic to your content offer. Create images optimized for posting on Facebook, Twitter, and LinkedIn. You can share these with your agency’s team and ask for their help in promoting the new campaign. You could even generate a tweetable link to make it easy for your staff to share. The goal is to get your agency in front of new prospects -- clients that match your ideal client profile. When they are ready to look for a new partner or have a marketing problem, you will be top of mind. To get introduced to these new prospects, consider budgeting for paid promotion. You can target users by job titles, industry, and company using LinkedIn sponsored updates. On Facebook, find users who “like” an industry publication or brand. And with Twitter advertising, you can target people by hashtag usage, keyword, behaviors, etc. Repurposing content is one of the best ways to increase the reach of your content. Depending on the subject, you could create a slide deck presentation of the information and upload it to SlideShare. Consider including calls-to-action throughout the slide deck or using SlideShare's lead generation feature where you can insert a form into the presentation. Once the prospect downloads the offer, you have the opportunity to re-engage the person and move them farther along in the buying process. Consider sending a personal note from the owner/CEO of your agency. Include links to positive press about your agency and high-quality guest posts authored by your staff. You could also provide the person with links to case studies that align with his industry (as identified when he filled out the lead form) or promote an additional offer to continue generating interest. Time these emails with a consideration for the length of your typical sales cycle. You wouldn't want to send three emails in the first month if most prospects don't typically become clients for three months or more. Benchmarking, testing, and optimizing the performance of your lead generation campaigns will not only help you to improve the performance of your campaign but will also lead you to have a better understanding of how best to create, launch, and promote an offer. Small changes -- changing the title of the ebook, CTA copy, format of the landing page, etc. -- can have a huge impact on the conversion rates of your campaign. These key insights can then be applied to the campaigns you launch for your clients, creating the perfect feedback loop to drive better results for you both.